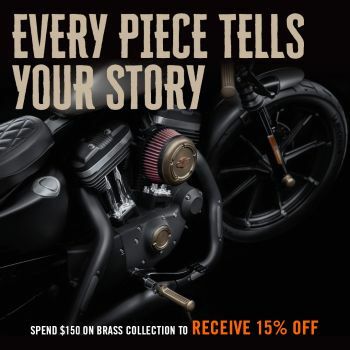 The authentic alternative to the typical chrome-covered or blacked-out look, the Harley-Davidson® Brass Collection delivers a warm, hand-crafted look to your custom ride. These minimalistic “living finish” components make a garage-built styling statement and are the ideal addition to your stripped-down bobber or café motorcycle. $150 in store and receive 15% off.